Could an Black Panther movie finally been made, and Captain Marvel. If it's a Captain Marvel film, I want Carol Danvers, not Mar-vell or Genis. I understand your point brotha but Mar-vell was the first and since they did GOTG and introduced that timeline it would be prudent IMO to start with Mar-vell. I hope to see Ms. Marvel show up in the Avengers franchise down the road though. Yes, but Mar-vell was also the most boring Captain Marvel. His son was crazy as hell, but hilarious and Danvers, well everything Mar-Vell could do she can do better. The Ant-man movie will have Hank Pym, but Scott Lang will be the hero, they could do something similar with Mar-vell and Danvers. Four of the biggest studios in the industry (Disney, Fox, Sony and Warner Bros.) have their hands in this lucrative pot of gold, and in some cases are using films to emulate the comic pages. WB’s recent announcement that there are ten DC adaptations scheduled from March 2016 (Batman v Superman) to June 2020 means that there will be over 40 films based on Marvel and DC properties over the next six years. From fans commenting on websites to professional film journalists, many have the same thing on their mind: with so many superhero movies scheduled for release (not to mention, nearly 15 previous years of the genre being in the limelight), are we about to witness an audience burnout with regard to comic book movies? Computer-generated imagery (CGI) and motion capture technology are going to continue to become more and more lifelike. There are tons of good storylines, script ideas, and characters in the comics themselves. A-list actors, directors, and script/screenplay writers will continue to be involved in these films. Due to the continuing success of these movies at the box office (Guardians of the Galaxy being the latest), the studios are emboldened to commit bigger and bigger budgets for these films to be done right (and when they're done right, the sky's the limit in terms of profits). And don't forget, superhero movies also allow the studios to make bank off of home video, licensing, toys, etc. Generally speaking, comic book superhero movies are beloved the world over by both film critics and rank and file moviegoers (most of whom have never read a comic book in their lives, but still love films adapted from comic books). Comic book superhero movies are here to stay. I couldn't be happier because this is my favorite genre by far. +1000 brotha! I'd much rather see a comic book movie instead of the lame assed action flicks of the 80's thru the late 90's. Those flicks were filled with short non imposing old white dudes that couldn't in real life pull off all of the stuff they were supposed to have so it was totally unbelievable for me watching it. At least in comic book movies most of the time they cast dudes that look the part which makes the unbelievable seem more real. vesuvius Wrote: Another thing I liked about Namor, he hit on Sue Storm and never apologized for it. Hell she sometimes gave in to his advances :lol: . So this is Sue with Namor? 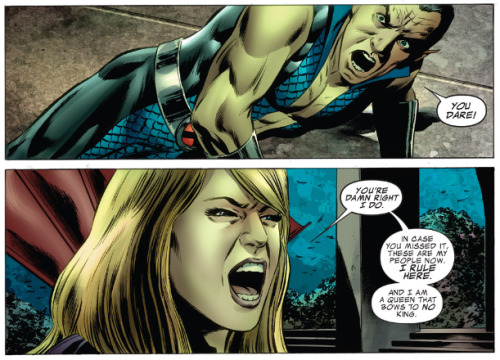 That's Sue Storm saying "And I am a queen that bows to NO king"? Sue Storm is a badass!!!! Yeah, she and Namor have had a thing for a while, don't know if they ever really did the nasty though? That's why I'm pissed Fox has the Fantastic Four because Namor reappeared in those comics and the story lines were epic. Nobody thrusts Namor because he has his own agenda and won't compromise even when he joins various teams (Avengers, Dark Avengers and X-Men). The only time he was really a good teammate was when he was with the Invaders during WWII. Namor is one of the most powerful beings in the Marvel Universe.